We last talked about laying the right foundation. We asked what foundation we are working on in our lives. But that begs the question: foundation for what? If our vision for our life, for our family, for the legacy we will leave is insignificant, then it doesn’t matter much that we’re not laying a foundation, or working on a foundation that will not support a massive infrastructure. This brings us to the topic for today. Some of you who have read previous posts will accuse me of a contradiction since I seemingly disparaged dreaming in my blog title “Dream or Burning Desire?” I can empathize with the motive for that charge. However, the apparent inconsistency is only that: apparent. In “Dream or Burning Desire?” I focused specifically on attaining a goal that you highly value. To achieve any goal, it must be crystal clear in your mind, and success must be a non-negotiable outcome. The goal cannot be a nice-to-have or be nebulous. None of that nullifies the importance of having a dream for your life, family, legacy that moves you to establish those clear and burning desires. 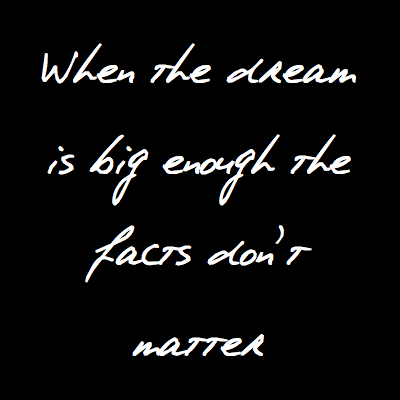 To live a life of significance you need a dream and that dream needs to be big. Let me give you one hinge: if your dream can be achieved in your lifetime it is TOO SMALL! You need a vision that is so big that it would require more than one generation to pull off! A dream gives a future focus. It frees you from the worries of the past to step into the future. A dream creates passion. That incredible resource of passion within you fuels success. A dream frees your imagination. Dreams allows you to tap into innate creativity and hidden genius. A dream gives you guidance. You find what is sacred within you and how to honor this. A dream is an insurance program. Dreams are insurance against the malaise of regret down the road. A dream keeps you safe. Dreams protect against the negative waste of yourself, your talents, abilities, and your creativity. A dream develops you as a person. A dream constantly stretches you and stretches you to be a better person. A dream inspires. A dream gives you gentle reminders of your highest values and a new sense of hope and direction. A dream gives you clarity. A dream can provide clarity regarding your life’s purpose and how you want to live your life. A dream is the cornerstone of achievement that enables you to create the life they wish to live! The following are three of the most significant barriers to dreaming big dreams. As you review them, ask yourself whether one or more are keeping you from really going after what you truly long for. 1. Fear. Vincent van Gogh said, “The fishermen know that the sea is dangerous and the storm terrible, but they have never found these dangers sufficient reason for remaining ashore.” Is there a particular fear that is keeping you from venturing out on the big sea of possibility? Fear of failure? Fear of success? Fear of insufficiency? Whatever the case may be, before you pack up ship ask yourself: What’s the worst that could happen by trying to achieve my dream? If the best that could happen outweighs the worst that could happen, move forward in confidence. 2. Lack of knowledge. “Where there is an unknowable,” said Thornton Wilder, “there is a promise.” Just because you don’t know all the details, that’s no reason to keep from dreaming big. History is strewn with great discoveries that came as a result of an adventurous soul simply venturing into the unknown with a dream to make a difference. If you’re using lack of knowledge as an excuse for not pursuing your truest dreams, ask yourself: What is the least I need to know in order to go for it? Seek to gain that knowledge, and then move forward. 3. Negative associations. “Keep away from people who try to belittle your ambitions,” said Mark Twain. “Small people always do that, but the really great make you feel that you too can become great.” What type of people do you associate yourself with? Are they people that are as excited as you are to see you achieve all that you desire? Will they hold you accountable for doing the things you need to, to get where you want? “Show me who you frequent,” reads a French proverb, “and I will tell you who you are.” To ensure that those you associate with aren’t keeping you from your dreams, ask yourself: Do I spend more time with dream makers or dream breakers? The poorest man is not he who is without a cent, but he who is without a dream. Get yourself a big dream!